Well apparently someone pointed out that propylene glycol in the brewing industry is used as a coolant (presumably since it has very low toxicity leaks are less of a concern). So she then basically goes oh I meant propylene glycol alginate presumably because she thinks (or at the least hope her readers think) that since the chemical contains the term "propylene glycol" that it's the same thing. Except it isn't. Propylene glycol alginate is an ester of alginic acid which is extracted from kelp. That's right it's an all natural and organic ingredient. Further propylene glycol has the chemical formula C3H8O2 whereas propylene glycol alginate has the chemical formula C9H14O7. 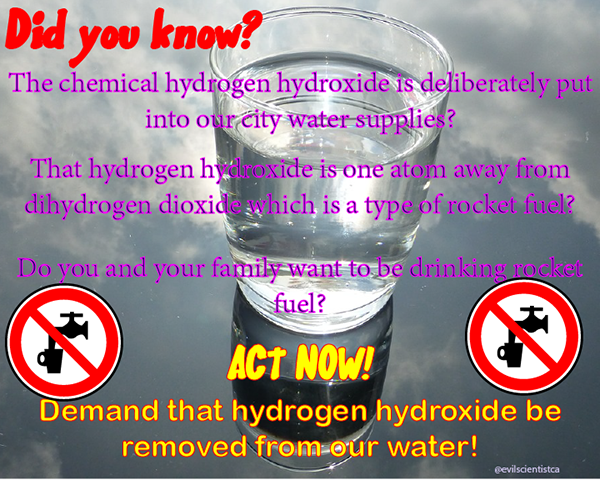 To say they are the same thing is to say that water (H22O2). So what we have here is an example of either how little Hari knows of even basic high school chemistry or that the hopes that the rubes that follow her and provide her with money have no understanding of chemistry. Now one could say it was a one off but it seems to permeate her entire site. Blogs by actual scientists such as Joe Schwartz of McGill have taken her to task on her many errors that if she had actually done any research she wouldn't have made. 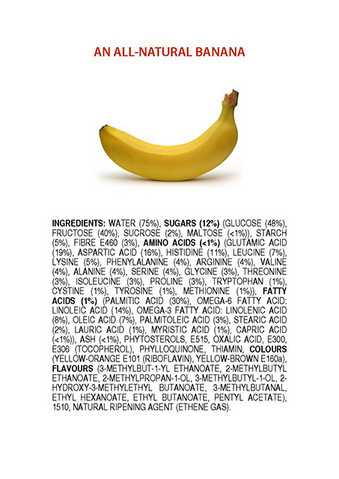 Lots of chemicals in there, most of which are pretty hard to pronounce, let alone know what they are. Some of them in large enough doses are lethal in humans. Should you not eat bananas? According to Hari the answer is no since it contains nasty chemicals. Now not only does she not have a firm grasp on chemistry but she's posted some doozies in the past that she's tried to disappear from the internet (one would think that someone with a degree in computer science knows that once you post something to the internet, it's there forever). First is her article on flying which is so rife with inaccuracies that when I use it in a class on critical thinking I have students (gr 9-10) laughing at it before I even go over what's wrong with the article. Think about that for a moment ?14 and 15 year old kids figure out that she's full of crap whereas her "army" has yet too. Looking at this article we can add that Hari also doesn't know a) the composition of the Earth's atmosphere and b) how airplanes work. To be fair she has a couple of stopped clock moments in the article, but the vast majority of it is hopelessly wrong. Then there's her microwave oven article (also disappeared) which can only be described as bovine scatology that a simple Google search would have prevented. I can only think that she just made the whole thing up, either because she is so ignorant of physics and chemistry that she believes it, or like the spelling errors in a scam letter, she posted it to clear her followers of anyone capable of critical thought. So Hari presents large swaths of information that are demonstrably wrong. When she makes errors she either doubles down, ignores them or tries to disappear them. So at the very least she's intellectually dishonest. But at this point is she simply a woefully misinformed do-gooder or an actual scam artist? Well lets look at what we have so far: Hari presents wrong information. When the information is so wrong even a child can see through it, instead of saying that the information was wrong and correcting it, she disappears it. When people with actual training in the fields of chemistry and nutrition point out the other information as wrong, instead of going "whoops" and correcting the problem, she attacks the messenger as well as claiming she was "misinterpreted". These are not the hallmarks of a misinformed do-gooder, but of someone who's livelihood is dependent on a continual stream of marks coming to her website to buy stuff (some of which containg the very same chemicals she says not to use or as much sugar as many beverages she pans) trying to protect her reputation as "knowledgeable". This has her leaning into con artist territory. She tells you not to eat certain things, but then makes money off of selling you things that contain the very same things. When her errors are pointed out, instead of correcting them she either disappears them or accuses those of pointing out her errors as being part of some big food conspiracy against her and her followers. Her actions are ones of someone who is creating a brand of herself for her own personal gain and defending that brand just like the food companies she bashes. So is Hari scientifically illiterate or a con artist? The scientific illiteracy is demonstrable, though could be an act. The fact she sells many of the "chemicals" that she opposes suggests she either doesn't check her labels as well as she tells everyone else to or knows that the stuff is there but would rather make a fast buck than be honest with her marks fans. Scam Stud (My favourite quote out of this one: I admire the way Food Babe can take a complex and nuanced topic and distill it down to an aliquot of pure error. It is a talent rarely seen outside of the Tea Party. These are just a small number of criticisms of Hari, most by actual scientists and physicians. The fact that Hari can gain such a following is truly an indictment on the state of science education in North America.